Enable your clients to save effectively with just one click. Our vision is for people around the globe to fulfil their dreams. That is why we created a platform that gives clients the opportunity to benefit from an end-to-end process for their savings and expenditures. Not only can individuals save for their goals but also find out where they spent too much compared to their benchmark. We believe in: Live fully whilst setting the groundwork for your dreams already today. All that by just signing up for our platform, which integrates your financial institutions products and services. To find out more, contact us. Add value to your services and business. Two steps ahead of the competition! The savings platform, created by Capital Lab, allows you to meet the needs of your clients and to support them in pursuing their dreams, taking into account their personal situation by assessing a variety of factors. 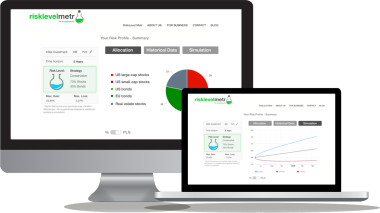 Our integrated robo-advisory component (risklevel metr) allows your clients to identify their individual risk profile and purchase directly the portfolios you created for them. The majority of people make investments unfitting to their own level of risk. Help them! Educate them about such mistakes and encourage positive changes to gain their trust, and ultimately broaden your client base. Explorer the journey that is waiting for your client. We work to deliver the best solutions for you! According to research, people save more effectively if they have a specific goal. Our platform assists your clients to select a goal and determine the target amount they need. Once set, we assist them in a fully-automated way to create a savings plan. We present which parameters should be set to achieve the goal. Tie your clients goals and dreams to your service. Our risk profiler assesses which strategy is appropriate for your client but let your financial products be the underlying to get your clients the returns they deserve. Increase your business’ sales by selling your products in an automated savings’ platform. Our platform gives clients the opportunity to monitor their savings 24/7. At each point in time, they can see how much they already have saved, how much they are lacking and what their target is. Motivation is the key to success.